The problem with my obsession with summer bounty is that I’m also convinced that most of the produce doesn’t need much to make it the best food in the world. I foresee friends accepting dinner invitations, expecting that I’m going to serve them, you know, prepared dishes, only to sit down to a table bearing nothing but boule, some sliced tomatoes, and wine. Maybe some kosher salt and black pepper. Cheese, if I’m feeling fancy. And I’d probably never notice if those guests thought that it was an odd main dish for a dinner party, because to me, it’s one of the best meals I can fathom. It turns out, though, that serving whatever goodness you find at your farmer’s market straight-up is completely acceptable. There was about a foot of snow on the ground this past winter when I ordered Deborah Madison’s book, Local Flavors (Louise cruelly brought it to the Yellow House and then moved out, taking all her belongings with her, howdareshe, and I had to get my own). Madison’s recipe for a “platter salad” kept me flipping to the same pages all winter and spring. Too many good things in season? No one dish to showcase them all? Turn them in to a platter salad—which is basically a nice Deborah Madison way of saying, slice up everything and serve it with a nice vinaigrette. With crusty bread to soak up the oil and vinegar, and a nice light merlot from Ben’s vineyard—this is the perfect end to a long work-week. And since it featured the first (!) little yellow summer squash from my garden, it was also the perfect beginning to a long, quintessentially summer holiday weekend. Let freedom ring, and enjoy, everyone. This isn’t so much a recipe as it is guidance. The point is to incorporate anything and everything you take home from the market or your garden into one dish. Use the vinaigrette for any medley of summer produce. Make your vinaigrette first, so the flavors can meld while you chop veggies. Mix scallions, garlic scapes, vinegar, and oil. Salt and pepper to taste. Remember that this is going to be the only treatment your veggies get, so don’t under-season. Let rest in refrigerator. If you want, blanch the shelled peas (I like them right out of the pod). Slice all cherry tomatoes in half. Shave the yellow squash into ribbons with a vegetable peeler (yup–raw! The same method that everyone used for raw asparagus this spring is perfect for raw summer squash). Gently toss all ingredients with the vinaigrette on a big platter. Serve with crusty bread and a light-bodied red wine, like a merlot or sangiovese. Thanks, Manda. I want to see you soon! I won’t blame you for snapping so many shots of your garden produce. 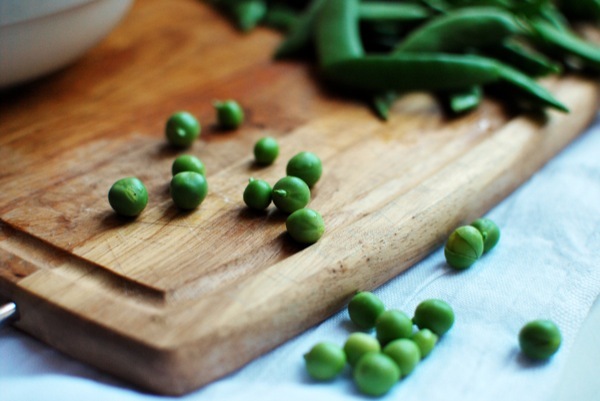 Those peas on the cutting board look so darling! And I’m definitely on board with your treatment of summer’s bounty. Summer cooking should be effortless–everything out of the garden (or from the farmers’ market, if you’re me) is pretty much ready to eat. This is one of the prettiest salads I’ve ever seen. Everything looks incredibly fresh, healthful and radiant. And those tomatoes…. wow! Your love and fascination with mother nature is refreshing and beautiful to read about. What a compliment, Kelly. Not sure if I deserve it, but thank you! Sarah, your simple, fresh and vibrant style of cooking is so refreshing. And your photography is amazing! I am interested in improving my photography skills – could you tell me how you learned to capture food so beautifully? I never write omg but this deserves an omg. You can tell the veggies were just picked, the kind of thing that makes me go crazy for. I can almost taste it, the kind of freshness that makes you believe there are fewer things fabulous then eating sunkissed summer veg! made this for lunch today and was a big hit. Loved the taste and even my five old ate it – just bites nevertheless. Will be trying more of your recipes. You are currently reading Summer platter salads at The Yellow House.